Today I learned about breaking rules and going with the flow. In almost 20 years of teaching, I have never abandoned a class to go shopping, but somehow on this Friday afternoon during a Toronto heat wave, it just seemed like the right thing to do. – Abandon ship in favour of a field trip. 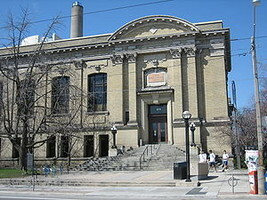 Our class was about 3 minutes from the University of Toronto bookstore, which happens to have a wide array of U of T-branded everything-you-can-imagine (great souvenirs of Toronto), and is located in a grand brick building at the centre of the U of T campus. So, we agreed to end the day on a high note. Everyone found something to take home, and just as important, I found out that flexibility in teaching sometimes means knowing when it’s time to stop (and shop).